With four degree burns all over his body and a spine that is severed from the waist down, the possibility of Detective Alex Murphy (Joel Kinnaman) surviving the ordeal is, according to the specialists, highly unlikely. It is most fortunate that the CEO of OmniCorp, Sellars (Michael Keaton), is scouting for a man to enroll in a program led by Dr. Norton (Gary Oldman). The hypothesis: Putting a man inside a machine will give the company a chance to ease the minds of a mostly robophobic American public and eventually annul a bill that bans crime-fighting robots domestically. One of the key problems with “RoboCop,” written by Joshua Zetumer, Edward Neumeier and Michael Miner, is a lack of dramatic focus. What kind of story does it wish to tell? A man who one day wakes up and realizes that he is part-machine? The complications that arise when business and science form a collaboration? The role of the media in politics and vice-versa? A family ripped apart by greed and corruption? Although these questions can be very interesting to explore, such are only worth sitting through with a high level of writing. This film excels in showcasing expected action scenes but suffers severely when it attempts to shed some insight. When bullets are involved, my attention was transfixed on the screen and my ears relished every sound when somebody pulls the trigger. The pop of the firearms are alive and coupled with camera movements with a sense of urgency, it is exciting to a point. The robotic suit of the protagonist is sleek and easy on the eyes despite never convincing us fully that with such a bulky exterior—not to mention the mass of the thing—aerial acrobatics is possible. Yes, there are a few moments when it feels cartoonish. I enjoyed that the villain is not really bad, per se. Sellars is a businessman and wants to make a lot of money. What kind of CEO of a billion-dollar company is not driven by capital? His justifications to reach his goal, one can argue, are the elements that make him villainous. Keaton plays his character like a real person. And in an action picture with shades of science fiction, it is critical that we get a taste of something that is grounded. Oldman playing the scientist, on the other hand, makes a mistake by embodying too likable a character. Doesn’t he want to make money, too? Funding is important. What does not work entirely is Alex/RoboCop’s relationship with his wife (Abbie Cornish) and son. Pick any of their scenes and it feels tacked on and forced—as if the only way for us to root for the good guy would be to reminded again and again that he has a family to leave behind. Cornish’s dramatic scenes are awkward. I could feel her trying to push the tears out. I felt her thinking about the lines rather than just letting go and communicate the anguish of a woman who is being denied to visit her husband. It is not entirely the performer’s fault. The women characters in the film are not given depth. 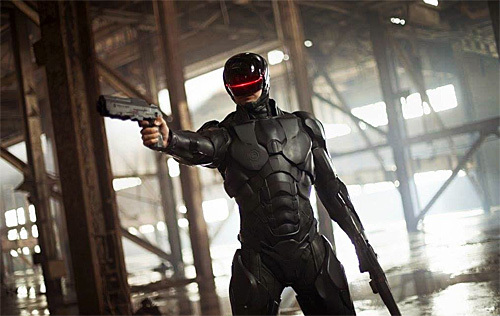 “RoboCop,” directed by José Padilha, is good-looking but empty. It is neither cerebral nor brawny enough—which makes it somewhere in between. And that is boring. When I was a kid, I remember my mom watching the original “RoboCop” on HBO before going to bed. A handful of its images made an impression on me. I may not remember the details but the fact that I could remember something about it two decades later proves that there is something extreme about it, an element that is dangerous, not safe. The filmmakers should have taken inspiration from the original and strived to push the envelope beyond what is expected, to prove to the naysayers when it was announced that a remake was in works that they were wrong to have doubted. Wouldn’t that have been icing on the cake? I liked this remake; not as good as the original, but it tells the story from a different perspective – the focus being more on Murphy and his acceptance of his new life. It bounced around a lot and never really delved very deep into any one particular area, like you pointed out, but that didn’t bother me; I just figured that was b/c the franchise was merely establishing Murphy and setting the stage for a series of sequels – hopefully all will be well-written. Good review Franz. Not perfection, but still a better remake than I expected. Which is definitely saying something.